A German pensioner has started his own search for the legendary Amber Room lost in the chaos of WWII. He believes he can find the priceless artwork looted by the Nazis in Germany’s Ruhr area but says the lack of new drill separates him from the discovery. 68-year-old Karl-Heinz Kleine thinks that the treasure stolen by the Nazis from the Soviet Union during World War II could be located somewhere in the town of Wuppertal in western Germany. This was the native town of the Nazis’ chief administrator in East Prussia, Erich Koch, who was responsible for the masterpiece transportation. “Wuppertal has a large number of tunnels and bunkers which have not yet been searched for the Amber Room. We have started looking in possible hiding places here,” Kleine told Reuters. The optimist also said he needs a new drill as the building company which lent him the drill he borrowed has requested its return. “The search is very costly. We need helpers, special equipment and money,” Kleine explained. For the 70 years that the Amber Room has been missing, neither communist East Germany’s secret ‘Stasi’ police, nor numerous other treasure hunters managed to find even a trace of what was dubbed the Eighth Wonder of the World. Back in 1716, Prussia’s Friedrich Wilhelm I gifted the outstanding ornate chamber made of amber panels to Czar Peter the Great.During World War II, it was dismantled and shipped by German troops to Konigsberg, now the most western Russia’s region – Kaliningrad. The room was put on display in Konigsberg Castle, but within two years it disappeared. Its vanishing inspires many conspiracy theories: Some historians think it was destroyed in the war, while others say the Germans smuggled it to safety. 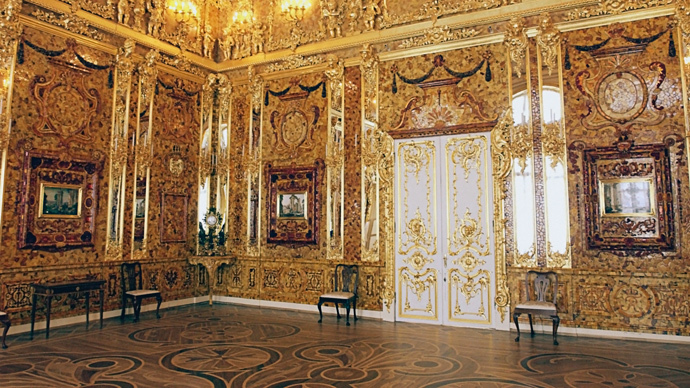 Decades later, German and Russian craftsmen made a copy of the Amber Room at The Catherine Palace outside Saint Petersburg from where it was stolen.